In addressing the question of what is the optimal size of the defense sector in a post-Castro Cuba, we must first establish some criteria by which we can judge different alternatives. In this paper, the criteria that I use is one where the level of the military sector is determined by the preferences of the median voter. In other words, I assume that a representative democracy will exist in Cuba after Castro and that the decisive individual is the median voter. Allowing for different ways of collectively aggregating the preferences of different individuals, while yielding a different optimal level, will still possess all the characteristics of the approach used in this paper. Individuals are assumed to make choices over consumption and national security. The latter is important because it can be seen as a way for individuals to self-protect against a future attack by an adversary who will confiscate some portion of their wealth if successful in its efforts. Defense serves to raise the cost of an attack to the perpetrator, i.e., it provides a means of deterrence to a country. Military spending is therefore a derived demand for an underlying commodity which is the increase in expected utility resulting from the higher probability of being able to consume one’s wealth at a future period in time. The next section of the paper briefly outlines the theory and the final section discusses the optimal level of spending for Cuba under various different scenarios regarding the economic and political conditions which could prevail in Cuba. This section generalizes the demand for national security in Seiglie (1988) in several directions. First, it introduces the possibility that expenditures by enemies decrease welfare just as those by allies increase welfare. Second, since the economy is open and in a steady state equilibrium, the budget constraint faced by individuals is altered. These extensions will be developed under the assumption that preferences take a particular functional form that generates linear military expenditure functions. where Me is the total amount of military capability produced by country e and therefore, some fraction of that total, ace, reduces the effectiveness of Cuba’s national security. The variable ve is a measure of hostile actions by country e which signal intentions and is assumed independent of Me. A similar interpretation holds for the positive spillover, McUS resulting from a military alliance, i.e., we assume some fraction bcUS of the US military serves to protect Cuba. In the model, the coefficient aij is viewed as a measure of the degree of spillover embodied in the armament of the opponent. For example, if the weapons of the opponent were mainly offensive then aij would be high, but if the weapon systems of the opponent were mainly defensive then aij would be low. The other coefficient vi can be viewed as a hostility signal. As such, it reflects the perception of threat or hostility directed towards country i from other nations. Analogously, b represents the spillins resulting from military alliances. where I denotes national income; E1 the expenditure of the ith individual; Ii his income; and s1 his savings rate. where Y is Cuba’s per capita income. Per capita income Y is a function of the degree of openness of the economy δ, i.e., I(δ) with I’(δ)>0. In other words, as the degree of openness of the economy increases, military spending increases. We can see from the above that the demand for defense is increasing in income and decreasing in the cost of maintaining the military, PM. Several other results emerge from equation (10). Firstly, Mc is increasing in the opponent’s level of military weapons, Me. Secondly, Mc is also increasing in the “degree of aggression,” Ve of the adversary, i.e., increasing in the level of conflict with adversaries. Thirdly, the weapon stock is decreasing in the level of weapons of the ally. This tendency to free-ride off the ally is increasing in the degree that the ally’s weapons have the non-rivalness property of a public good and in the strength of the alliance. This degree of non-rivalness is implicitly incorporated in bcUS. This coefficient also captures the fact that an ally that is not very likely to intervene on behalf of Cuba will not greatly reduce the latter’s level of armaments. Mc is also increasing in the threat of the adversary’s weapons, ace. For example, the proximity of the two countries geographically is important if the countries do not possess long range missiles or bombers so that the closer they are the higher is ace, or if they are contiguous countries the mix of the weapon stock between offensive and defensive systems is important with an increase in offensive weapons implying a rise in ace. finally, Mc is decreasing in the tax share, ti. where I is real national income, S (equal to s*I) is real national savings and β1 , β4 and β6 are greater than zero and β2 β3 and β5 are less than zero. Several propositions emerge from this expenditure function, namely that military expenditures should be increasing in: 1) income; 2) the opponent’s expenditures; 3) the level of conflict or aggression directed towards it from other nations and decreasing in: 4) allies’ expenditures; 5) the savings rate; 6) the tax share; 7) the minimum subsistence level; and 8) the strength of the alliance, bcUS. Finally, the above assumes that countries trade at world market prices. Since the gains from trade are decreasing in distortions to world prices and since wars or international conflicts serve to raise the transaction costs involved in trade with the rest of the world, we expect that the greater that an economy is dependent on world trade and therefore, the greater is the sum of consumers’ and producers’ surplus derived from this trade, the greater will be its military expenditures in order to protect these gains. Therefore, military expenditures should be increasing in the extent that an economy is open to world trade. In this section, estimates are presented for the parameters of the expenditure function (equation 11) derived above. The variable Oi, denotes the degree of openness of the economy. We also introduce a constant to the equation, as well as an error term, ei. The definitions of the variables are as follows. Our dependent variable, ME, denotes the real military expenditures of the country. As for our explanatory variables, I refers to the level of real GNP and S to the level of real national savings for country i. As for (1/ti), it is the inverse of the tax share of the representative individual in the country, which from equation (8) is equal to the inverse of the share of real income of the representative individual in GNP. As a proxy for this variable we have used a Gini coefficient of sectoral inequality published by the World Bank. A better proxy would have been a Gini coefficient based on individual income or households, but such a measure is unavailable for many of the countries used in our sample. We therefore expect that as inequality increases (the Gini coefficient rises, i.e., ti falls and (1/ti) rises), the country’s military expenditures MEi, should rise. Therefore, we expect the sign of its coefficient to be positive. As for the other variables, MEj represents the military expenditures of the adversarial nation. We expect the coefficient, b4 to be positive. Conversely, MEk denotes the military expenditures of countries allied to country i. This captures the spill-in from the alliance’s expenditure into the particular member country. Our model predicts the sign of this variable to be negative due to the free-riding problem inherent in public goods. As for our coefficient of aggression, vj, which measures the aggression from the rest of the world towards country i we expect its sign to be positive, i.e., increases in foreign aggression should lead to increases in expenditures. To arrive at a measure for this latter variable I have used the Conflict and Peace Data Bank (COPDAB) developed by Azar (1980a, 1980b). The COPDAB consists of approximately 500,000 international events which occurred from 1948 to 1978. Each event entry in the data base lists the actor and target nation, the issue involved and the date of occurrence. The source of information is taken from close to 100 regional and international publications. The data base consists of a ranking of events according to a predetermined scale aimed at quantifying the intensity of the event ranging from the most cooperative given a value of 1, such as the voluntary unification of nation-states to the most conflictful which is given a value of 15, an extensive war act. In order to arrive at a level of aggression towards a country from the rest of the world (vj) I have taken the average of the scaling of hostility from all countries in the data base towards that particular country during the year and conversely. So for example, if a country has had three international interactions in a particular year: 1) war was declared against it by a neighboring country (scale=15); 2) a country strongly attacked it verbally (scale=10); and 3) it formed a major strategic alliance with another country (scale=2), then the index of hostility for the year would be 9, (15+10+2)/3. This index was calculated for all countries in the sample listed in COPDAB for each year. Using these estimates for the variables we can analyze the level of defense expenditures in a post-Castro Cuba under various scenarios. Before we do so, Figures 1 and 2 shows the estimated size of the Cuban military for selected measures. It is obvious that there has been a sharp decline in the size of the military sector whether measured in real 1988 dollars or as a percentage of total output. Recent estimates place Cuban military spending in 1988 dollars at 354 million dollars and its share in total output declining to 2 percent. 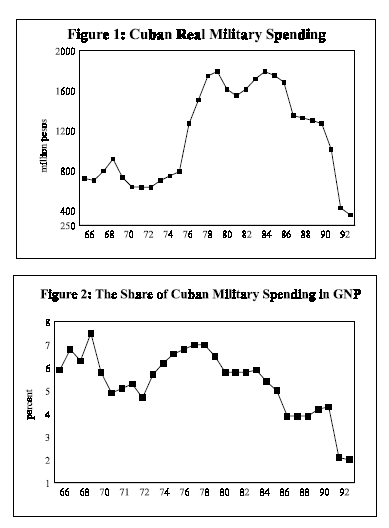 The natural question to ask is if Cuba had different economic and political characteristics, what would be the optimal level of military spending? Given the space constraints, let me propose one of many plausible scenarios. Suppose that Cuba had a level of GNP (GDP) equivalent to that of Chile and a national savings rate of 20 percent (less than Chile’s). Furthermore, assume that Cuba had as a natural adversary a country such as the Dominican Republic and that Cuba had the United States as an ally (as is the case for example, with Canada). Finally, assume that the Cuban economy is as open as that of the Dominican Republic or Jamaica. Under these conditions, Cuba would have to confront an international environ ment with a level of hostility towards it resulting in a COPDAB score of 9.2 to justify having a military for national security reasons. This score is defined as experiencing mild verbal hostility or discord with the rest of the world. More specifically, this corresponds to low-key objections to policy or behavior; expressing discontent through third parties; objections to explanation of policy and requests by other countries for a change in policy. It is surprising that to justify current levels of Cuban military spending would require a value close to 10, which corresponds to a climate of strong verbal hostility towards it. Examples of this are strong condemnations by the international community of its actions or policies; threats of retaliation for acts it commits; denunciation of Cuba’s leaders, system or ideology; strong propaganda attacks; postponement of head of state visits or withdrawal from meetings or summits; and blocking or vetoing actions in international bodies. It may seem that this is the scenario that Cuba currently is facing in the world and this is what justifies its current levels (estimates). This is not in fact the case since the scores or values for the COPDAB is for an average of all countries’ actions towards Cuba. Therefore, while the United States may have a hostile policy towards Cuba, the rest of the world has much better relations with it, and therefore, the value or score is lower. In conclusion, Cuba would have to be the subject of fairly widespread hostilities by members of the international community to justify a post Castro Cuba having any significant military, if as I suggest, it proposes to ally itself with the United States (as is currently the case for NATO member countries or for that matter, Puerto Rico). Azar, E.E. “The Code Book of the Conflict and Peace Data (COPDAB): A Computer Assisted Approach to Monitoring and Analyzing International and Domestic Events,” University of North Carolina, Chapel Hill (mimeo) (1980a). Azar, E.E. “The Conflict and Peace Data Bank (COPDAB) Project,” Journal of Conflict Resolution 24 (1980b) 142-152. Benoit, Emile. “Growth and Defense in Developing Countries,” Economic Development and Cultural Change 26 (January 1978) 271-280. Bergstrom, T.C. and Goodman, R.P. “Private Demands for Public Goods,” American Economic Review 63 (1973) 280-296. Boulding, Kenneth E. Conflict and Defense. Boston: Harper and Row, 1961. Brito, D.L. “A Dynamic Model of an Armament Race,” International Economic Review 13 (1972) 359-375. Brito, D.L. and M.D. Intriligator. “Conflict, War, and Redistribution,” The American Political Science Review 79 (1985) 943-957. Brito, D.L. and M.D. Intriligator. “Nuclear proliferation and the armaments race,” Journal of Peace Science 2 (1977) 213-218. Connolly, Michael. “Public Goods, Externalities and International Relations,” Journal of Political Economy 78:2 (1970) 23-49. Deger, S. “Economic Development and Defense Expenditure,” Economic Development and Cultural Change 35 (October 1986) 179-195. Deger, S. and S. Sen. “Military Expenditure, Spin-off and Economic Development,” Journal of Development Economics 13 (August-October 1983) 67-83. Dudley, L. and C. Montmarquette. “The Demand for Military Expenditures: An International Comparison,” Public Choice 37 (1981) 5-31. Findlay, Ronald. “Factor Proportions and Comparative Advantage in the Long Run,” Journal of Political Economy (January 1970) 27-34. Garfinkel, Michelle. “Arming as a Strategic Investment in a Cooperative Equilibrium,” American Economic Review 80 (March 1990) 50-68. Intriligator, Michael D. “Strategic Considerations in the Richardson Model of Arms Races,” Journal of Political Economy 83 (1975) 339-353. Isard, W. Arms Races, Arms Control, and Conflict Analysis. New York: Cambridge University Press, 1988. Johnston, J. Econometric Methods. New York: McGraw-Hill Book Co., 1984. Klein, Lawrence R. and M. Gronicki. “Defense Spending Among Warsaw Pact Countries: Implications for LINK Simulations of the Arms Race,” mimeo, University of Pennsylvania (1988). Komiya, R. “Non-Traded Goods and the Pure Theory of International Trade,” International Economic Review (June 1967) 132-152. Leontief, W., and F. Duchin. Military Spending. New York: Oxford University Press, 1983. Murdoch, J.C. and T. Sandler. “Complementarity, Free Riding, and the Military Expenditure of NATO Allies,” Journal of Public Economics 25 (1984) 83-101. McGuire, Martin C. Secrecy and the Arms Race. Cambridge: Harvard University Press, 1965. McGuire, Martin C. “A Quantitative Study of the Strategic Arms Race in the Missile Age,” Review of Economic and Statistics 59 (1977) 328-339. Olson, M. and Zeckhauser, R. “An Economic Theory of Alliances,” Review of Economics and Statistics 48 (1966) 266-279. Peltzman, Sam. “The Growth of Government,” Journal of Law and Economics 23 (October 1980) 209-87. Sandler, T. and J. Forbes. “Burden Sharing, Strategy, and the Design of NATO,” Economic Inquiry 18 (1980) 425-444. Sandler, Todd. “Impurity of Defense:An Application to the Economics of Alliances,” Kyklos 30 (1977) 443-460. Seiglie, Carlos. “International Conflict and Military Expenditures,” Journal of Conflict Resolution 32 (1988) 141-161. Seiglie, Carlos. “Determinants of Military Expenditures,” in Economics of Arms Reduction and the Peace Process, edited by Walter Isard and C. Anderson. Amsterdam: North-Holland, 1992. Seiglie, Carlos. “Causality in the Military Expenditures of Potential Adversaries,” Economics and Politics (November 1996). World Bank. World Tables. Baltimore: Johns Hopkins University Press, 1976. World Armaments and Disarmament–SIPRI Yearbook. London: Taylor and Francis Ltd., various years. World Military Expenditures and Arms Transfers. Washington: United States Arms Control and Disarmament Agency, various years.